Set amongst fields of lavender at Mad Lavender Farm in Milford, NJ, hummingbirds feast on wild flowers, roosters greet the morning, and farm guests gather to find inner peace, breathe deeply and mingle with Dwarf Nigerian goats. 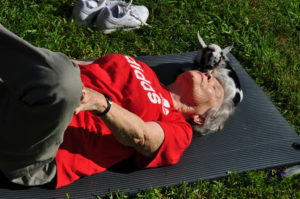 Country Meadows of Forks residents enjoy a yoga class with Dwarf Nigerian goats at Mad Lavender Farm. Seniors from Country Meadows of Forks in Easton, joined the class to enjoy a relaxed morning participating in a craze that is sweeping America…goat yoga! “Yoga is about expansion: expansion of what we expect in our lives and opening the heart, and goats are good at that,” says Adrienne Crombie, farm co-owner. Curious goats wander throughout the class space, interacting with guests. It brings a light, joyful energy to the already tranquil experience. It’s not the most quiet yoga class, but definitely the most memorable. A goat channels the peaceful energy during a goat yoga class, resting on the mat with Country Meadows resident Barbara Vones. The class included easy to moderate poses, breath work and meditation connecting participants to the earth and each other in celebration of all living things. 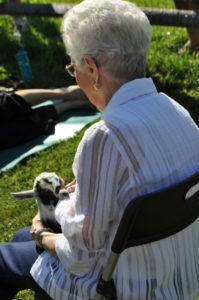 A goat enjoys snuggling with Country Meadows resident Blanche Vargo.